I’m back. Again. It’s been crazy! I don’t want to bore you with a long-winded post so I’ll try to be brief. Try! 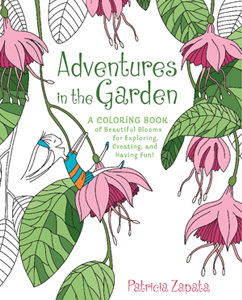 I spent all summer illustrating my second coloring book called Adventures in the Garden. I’m not kidding — it really was all summer. So much so that Gustavo had to take up a lot of my mom duties and he did fabulously (thank you my Mr. Z!). 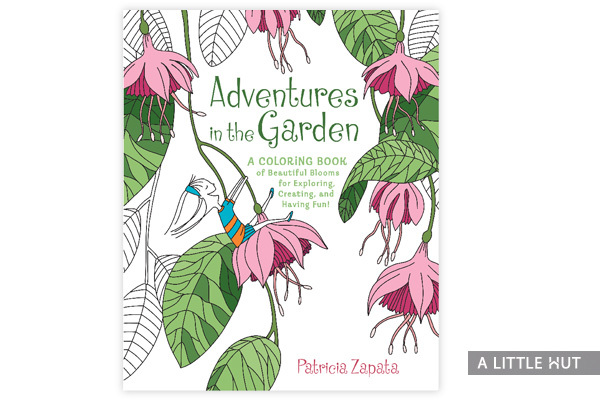 The book will be released in March 2017 — perfect spring fun. 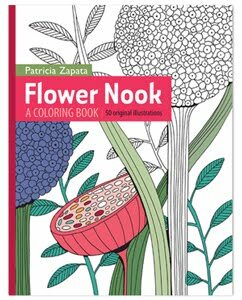 For those of you that have my previous coloring book, Flower Nook, you’ve seen a hint of what this new one is about. Little girls floated in and out of some pages there. In Adventures in the Garden, they are on every single page. The target audience may be girls 7-10 years old, but I think this can be enjoyed by girls 7-100 years old. The illustrations are based on ideas that I had as a little girl, of what I thought it would be like to be tiny and walking around a garden. They were also based on ideas that my favorite muse gave me. My daughter Catalina really was a great inspiration. If I was stuck, all she had to do was give me a couple of cues and I was off again. I could tell she loved playing the role of art director when I was working on something she’d suggested. I couldn’t help but smile and had my silly clap-clap moments when I drew something better than I had imagined it. It’s a project that tested my discipline, limits, and confidence in my illustrations. It was worth every minute spent working on it. I hope it shows. I used every spare moment working on the 46 illustrations in order to turn in the manuscript on time. My deadline of August 30th was the day before I traveled to Italy! Yes, I went to Italy for 17 amazing days! I’d always dreamed of going to Italy so this was really a dream come true. Enjoying it with my mother was the icing on the cake. It was a mother/daughter trip where she got to spend some quality time with her childhood friend — even better. I posted just a handful of the hundreds photos I took on my Instagram feed. The eye-candy was just incredible. Art history, food, sights and great people — that’s what I experienced in Italy. I loved Rome and Venice, but if I had my choice I’d live in Florence — definitely more my speed. I know, for sure, that I’d love to go back some day — even if it could be to just relive those few days on Monte Argentario and jump in the Tyrrhenian Sea again. Ahhh. Getting back to reality has been harder than I thought. Never mind the jet lag. My brain is overloaded and scattered. I have ideas pouring out of me. A Little Hut wasn’t forgotten at all. I simply couldn’t muster the time and/or energy to be completely committed. I didn’t want to come back until I was ready. Now I am. So, look for more projects in the days to come. I can’t wait! One last thing… I just found out that some designs that I submitted months ago will become part of a fabric collection for next summer. What a nice surprise to come home to! Happy first week of Fall — Finally cooling off around here!